Points are scored with the tip of the blade and must land on a valid target: the torso from shoulders to groin in the front and from the shoulders to the waist in the back. The arms, neck, head and legs are considered off-target and hits to non-valid targets temporarily halts the fencing action, but no points are awarded. This concept of on-target and off-target evolved from the theory of 18th-century fencing masters, who instructed their pupils to only attack the vital areas of the body – e.g. the torso. Of course, the head is also a vital area of the body, but attacks to the face were considered unsporting and therefore discouraged. For newcomers, one of the most challenging concepts to grasp is the rule of right of way. Right of way is a theory of armed combat that determines who receives a point when both fencers have landed hits during the same action. The most basic and important precept of right of way is that the fencer who started to attack first will receive the point if they hit a valid target. The fencer who is being attacked must defend themselves with a parry, or somehow cause their opponent to miss in order to take over right of way and score a point. A fencer who hesitates for too long while advancing on their opponent gives up the right of way to their opponent. A touch scored against an opponent who hesitated is called an attack in preparation or a stop-hit, depending on the circumstances. Additionally, the referee may determine that the two fencers truly attacked each other simultaneously. 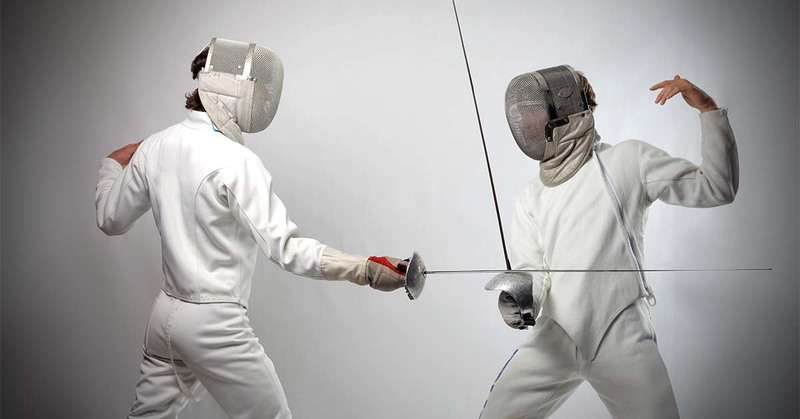 This simultaneous attack is a kind of tie – no points are awarded, and the fencers are ordered back to en garde by the referee to continue fencing. While it may be difficult to follow the referee’s calls (especially because the officiating is performed in French), the referee always clearly raises their hand on the side of the fencer for whom they have awarded a point. Watching for these hand signals can make it easier for newcomers to follow the momentum of a fencing bout without understanding all the intricacies of the rules. If your child is interested in learning foil fencing, contact us at Lilov Fencing Academy in Cedar Grove today. We offer lessons for kids of all ages in a great facility with the best staff in the country.